Solving global warming will require universal, common sense, golf background checks, to keep duffers from filling up the ocean with golf balls. And we need to get the terrorist USGA out of the way, to solve this critical problem. You can find golf balls all over the Australian countryside. The crows (Corvus coronoides) steal balls off the fairway and fly away with them, then drop them after realizing they aren’t edible. First they tell us that plastic lasts forever and never degrades. The comes along this article claiming the exact opposite. So which is it? OT, but this (see link) appeared in today’s Milwaukee Journal-Sentinel, and mentioned that the Great Lakes region was warming faster than the rest of the country. IIRC, Tony, you have abundant evidence (as did Paul Rutan in one of his presentations) that the opposite was true–the upper midwest in general was experiencing a cooling trend (at least as far as max temps go; mins may be rising somewhat–I can’t recall specifically). Any chance you could help us debunk this politically-funded/inspired piece? As always, thank you for everything you do! Yep! The first step will be to make Golfers register their balls! Once the Fed knows about the balls of enough golfers the democrats will want to take them. I am certain that I’ve contributed far more than my share of golf balls in the drink! One of the biggest killers of western men: golf. That and lawn bowls. I suppose California will have to ban golf; I mean they’re just as bad as that googolplex of plastic straws covering the planet. It’s not as if that were just made up by a child and adopted by the other children, ie the Demorats. According to Carl Sagan, there is like, only one straw when compared to the ignorance of leftist politicians and global warming nutters. The lies just keep getting more blatant. Their problem is that they just can’t find enough stuff to blame global warming on and so just have to return to singing Canary’s and tell us not to believe what we see and hear. Nobody that didn’t just fall off the turnip truck believes them. Haven’t they predicted that the great lakes will run dry as result of global warming??? I guess as soon as it gets a bit specific the lies are wuthering like a cancer in all directions. There is spot in the middle of the woods that I walk by and strangely there is a small area where golf balls show up. In the last 14 years, 7 golf balls have appeared and each one is by a different manufacturer. The nearest house is 500 feet from this spot and the woods are so thick, it is hard to see how they arrive at this location. Perhaps there is a golf course in a parallel universe and they sometimes drop in. I would think that “Bruce of Newcastle” has the answer (March 21, 2019 at 10:01 pm) – Crows! 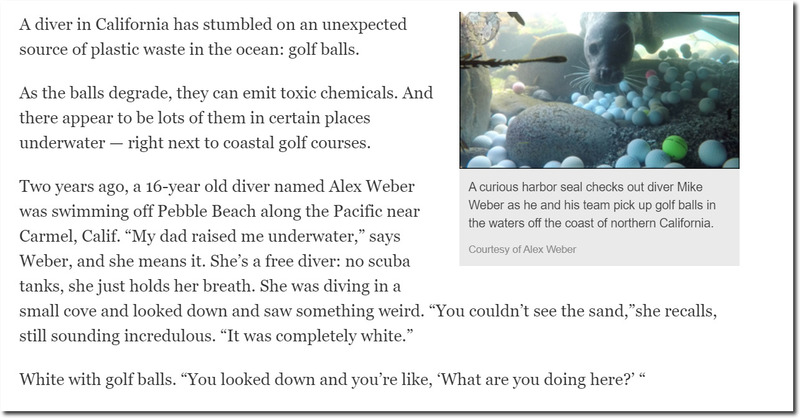 I am pretty sure that golfballs are almost 0.0000001% of all plastic waste in the oceans. are for sure almost half as toxic a single Tesla car battery. Nobody needs to drive more than 80 yards at a time. Lose your ball, go home. Unlike baseball, the fairway does not widen out with distance, thus the longer you are off the tee, the more balls you lose and the more you contribute to climate change. Thus anyone that hits the ball more than 250 yards needs to be banned from the game. Hole-in-one will soon be mandatory.